The curious hidden exit of West Finchley station opens onto the long suburban wind of Nether Street. By the 14th century this route, sometimes known as Lower Street, was already regarded as an ancient way. Now it trickled with Saturday morning traffic and occasional joggers, a string of quiet local stores leading away from the station. A quick survey of my surroundings indicated the distinct declivity to the west of the road, and a short trek between ranks of pleasant homes led me towards the bottom of the valley. From the top of Fursby Avenue a pair of glowering youths, hooded and hands wedged into pockets watched me from a bench, occasionally spitting on the ground. I felt their frustration - it must be hard to rebel in Finchley, where there's almost no-one around to pass judgement. I glanced back, hoping that they'd recognise my effort, before I plunged into the trees and began my walk along the Dollis Brook. I could have struck out further north, given how eminently walkable this tiny but proud waterway is - but in truth even coming this far had been a last minute decision. This walk had a difficult genesis - one option among three, in a month where I knew I'd be in London more than once. I'd originally intended to disembark further south to pick up the River Brent at Hendon, or the Dollis Brook at Finchley Central - but here I was just close enough to the edge of things to feel like I was walking into London. If the fairly exclusive golf course would permit it and I could strike out directly north west, I'd find myself crossing open countryside as far as the M25 at London Colney. These strange frontiers with their unsettling sense of being the last-street in London exist all around the perimeter, but perhaps feel strangest here on the northern flank of the city. Whatever the circumstance which got me here, it felt good to be walking beside water. Easing a sore left foot into action, I set off along the course of the brook which edged around allotments busy with gardeners hauling in their late crops. Having tramped the edges of a good number of waterways in London, I'm used to being largely alone on these walks. The occasional cyclist or jogger sometimes appears, but largely the footpaths which flank streams and rivers seem to be off-limits on weekend mornings. The officially sanctioned activities take precedence: shopping, DIY and so on. The Dollis Brook however, appeared much beloved by the locals. My walk through the edges of Finchley was busy with dog walkers who shadowed me: when I paused to take a photograph they seemed to stop to watch their animal grubbing in the generous carpet of leaf-fall. When I set off again, I'd hear the panting and pattering behind me. It was clear that being out here without a lead dangling from my wrist marked me out as an odd-ball. The owner of a particularly nervous little terrier asked me urgently "Is your dog behind you?" presumably worried it would go for her trembling charge. When I replied that I didn't have a dog with me, her relief quickly turned to concern. If I wasn't walking a dog here, what on earth was I doing? The brook babbled pleasantly, but it seemed to be nothing more than a backdrop - for the young religious pamphleteer who was regretting starting a conversation about Jesus with a park drinker, or for the pair of designer-clad women trying to navigate their way through a conversation about a Muslim friend who wore a veil at a wedding with their liberal credentials intact. "Well of course if she chooses to...." "Yes, but I'm not sure if it's sexist, or racist. Y'know?" "Maybe it's a personal thing really. Not our business?" "No. We can't judge" "But she did look stunning!". Their dogs, ignored and bored by the chatter, plashed into the nearby brook. The path crossed and recrossed the Brook to negotiate a minor tributary joining from the east at Lovers Walk, then skirted a pond almost entirely buried within the trees which lined the valley. Suddenly, I was deposited on Dollis Road - a furious B-road which lurched around a blind bend from Finchley to Mill Hill, traffic barely slowing for the curve. Forced to cross the road, I carefully waited time before heading under the slender legs of Dollis Brook Viaduct. This tall copper and honey-coloured brick structure carries the rather forlorn stub of the Northern Line over the Dollis Valley towards Mill Hill East station, providing the so-called Underground with its paradoxical highest point above sea level. 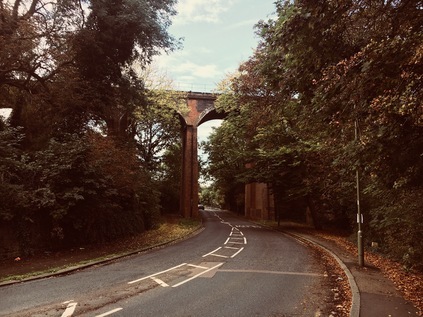 The line which passed overhead had suffered a chequered history: opened in 1867, the Great Northern Railway's line to Edgware was reduced to a branch line as early as 1872 when the line from Finchley to High Barnet came into use. Transfer to London Transport in the 1930s offered a new lease of life to the line, and double-tracked and electrified it would form part of the ambitious Northern Heights plans, with a new link to Edgware and beyond to the speculative new horizons of Bushey Heath approved. The war intervened - but unlike many of the schemes slated for delivery, a little work was actually completed with a single track over the viaduct electrified and opened to Mill Hill East station in 1941. However, that is largely what has remained since, and now outside the peaks a shuttle train operates high above the valley, with the course of the railway beyond now largely developed but still discernable by the broad curving sweep of new-build homes on its tell-tale footprint. I lingered under the viaduct long enough for the shuttle to clatter overhead, road traffic drowning out the noise of the train. Rather like the Piccadilly Line's crossing in Arnos Park, the row of voids in the brickwork stretched ahead creating a strange optical illusion of infinite arches, and under the nearest arch the brook trickled, unheard and unremarked by the passing drivers. Beyond the railway viaduct, the path beside the brook was hemmed into a narrow green tunnel between suburban streets, and again it was the preserve of dog walkers with their evident suspicion of those without canine accompaniment. At Windsor Open Space the path opened into a wider linear park, spreading to the east of the Dollis Brook. I had passed close by before and soon found familiar territory where the footpath sloped down into a narrow subway to pass under the A504. Soon afterwards a bridge carrying the arms of Middlesex lifted the traffic of the Great North Road over the valley towards its confluence with the North Circular. I made slow progress through these bottlenecks, pausing to let dogs pass by, with their panting owners trotting after them in pursuit. 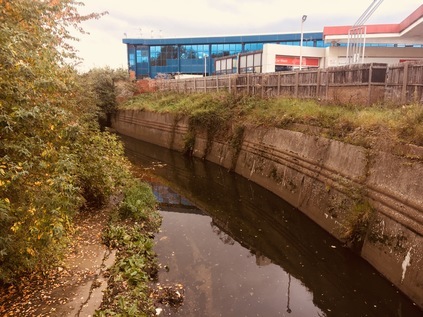 This area was familiar from walking around the North Circular, and I noted the pleasant little playpark where the Mutton Brook trickled in from the east, a family of children clambering over the equipment while a tired mother lay back in the surprisingly bright morning sun. Nearby the Dollis and Mutton Brooks finally met with their joined waters becoming the River Brent, which started its sluggish swing to the west by skirting Decoy Pond and forming the western extent of Brent Park. The North Circular was asserting its presence here, and I was reluctant to encounter it. I've no objection to the road - and even have something of an affection for its strange loop around the northern suburbs of London - but I felt like in some ways I was still processing the complete circle I'd recently completed. There was however, no escape from Brent Park without briefly joining the haze of dust and fumes, as I encountered the first of many surprising and frustrating diversions here with a footbridge and park exit onto Brent Street closed for repairs. I stepped reluctantly onto the pavement beside the six lanes of traffic, knowing that the twinge of protest I felt in my foot as I misplaced it on a flagstone was the price I'd pay for walking beside this road today. As soon as possible I retreated into Brent Street and took to the side streets of Shirehall Park. The rumble of the road was never far away as I ambled between decent villas and pleasant gardens tucked into a curious corner between the North Circular and the A41. A family wandered towards their car, either unconcerned or resigned to the road and its environs being a guilty, dark orange stain on the Mayor's recently released pollution map. I crossed briefly into the scrappy edge of Hendon Park to climb the footbridge over the Edgware branch of the Northern Line, soon finding myself beside the impassable shudder of the A41. To the south the road was soon entangled in the complex junction with the North Circular - I'd negotiated that before and I didn't have the energy or patience today. Instead I struck out north along the rather typical arterial route flanked by rows of fine houses which never expected to sit on such a major route. I soon found a grubby subway beneath the carriageways which delivered me to the road's western side immediately beside a pedestrian entrance to Brent Cross Shopping Centre. It wasn't what I'd planned, but it was time to brave a crossing of the retail jungle. Getting into the Shopping Centre was the first challenge. The sloping footpath led me along the edge of an orbital route, peppered with roundabouts and zebra crossings which appeared to be entirely ignored by the drivers racing for parking spaces near to the doors. Once within the loop of access road the signs 'To The Shops' led me between two huge concrete car parks, towards the functional grey rear of the structure. The path divided and I could 'Use both doors for shops'. I muttered 'surely either?' to myself but realised that Brent Cross isn't interested in the individual shopper - it speaks to the collective mass. Some of them had already arrived. Less than an hour into the centre's day, there was a dedicated band of customers sluggishly navigating the complex, scoping out their next move. They moved slowly, filling the broad aisles and failing to acknowledge my sweaty bustling around. I wanted out of here as soon as possible - malls unsettle me. Never comfortable with large empty spaces, the weird light and muted echoes of sound disturb my balance and awareness just enough to make me queasily nervous. I shuffled behind the touring bands of shoppers to the toilets, then down into the lower levels to find a cold drink. I settled for a nearby WH Smith rather than detouring back towards other options. The crowds had grown steadily since I arrived, and they were even less inclined to give way than the cyclists and dog walkers on the river path. I struggled out through John Lewis into the car park, and didn't pause until I'd skirted the car park and found another footpath out of the site. I didn't particularly care if I looked suspicious on the plentiful forests of CCTV cameras now - it felt like an age since I'd felt the less-than-fresh air outside. I slowed my pace, walking gratefully along Brent Park Road, and considering my options. The river ran parallel to my route, but to take a closer walk along it would involve navigating the complexities of Staples Corner once again. While the return to the North Circular hadn't felt as jarring as I'd expected, thoughts of navigating the highwalks and crossings at that junction once again weren't edifying. Instead I passed under the concrete embankment carrying the nascent M1 and then negotiated a series of ever-lower bridges carrying slip roads and the tracks of the Midland Main Line. Finally I emerged on the A5 - following the straight track of Roman Watling Street. Crossing the tide of traffic divided by a high metal fence was impossible - instead I needed to walk north here, towards West Hendon and the start of a recent walk. 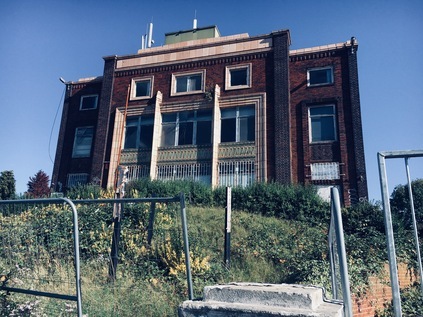 The growing decay of the businesses along the main road was starkly contrasted with the tall, modern apartment blocks growing behind the Victorian terraces and tired 1980s car sales forecourts, offering views across the reservoir. The decorative frontage of Philex House was a welcome surprise, derelict but still remarkably detailed and impressive. The still extant electronics company had followed the pre-Olympic exodus of industry up the Lea Valley ending up in Bedfordshire, but its fine old headquarters still stood - for now at least. I finally crossed the street at the curiously named Cool Oak Lane - a brand new Range Rover occupying the central lane with his bumper distorted from a recent skirmish at the lights. He gestured angrily at his 'phone behind the toughened glass windscreen - a mute rage at the injustice of the A5. Meanwhile Cool Oak Lane was remarkably close to where I'd crossed the street previously, and I kicked myself for not having spotted this way to Brent Reservoir. The lane narrowed to a tiny bridge over the neck of the lake, cars signalled over in turn. I spotted a crossing button and pressed, claiming my own pedestrian-timed gap in the sequence. No time to snap a shot of the vast body of water stretching to the south west and shimmering with bird life. I had to reach the west bank before the tones ended. The northern banks of Brent Reservoir felt pleasantly wild and unloved. The rough path littered with cracked horse chestnut shells and a growing mulch of fallen leaves, climbed to shadow the water but remained within the tangle of autumnal woodland. The footway wound around the lake, dipping inland to avoid denser clumps of trees, with occasional cleared areas leading towards the lake to allow access for fishing points or views across the silvery water. Waterfowl clucked and skittered from the undergrowth into the deep, cold water. Autumn had certainly come to Brent, and I sensed darker skies closing in after the sunny morning. I realised I could have scrubbed around to find an obscure path beside the river had I stuck to the south bank, but I'd have effectively been delivered to the same problem: Neasden. The widening fan of sidings around Neasden Depot present a huge barrier here, and a fairly inconvenient situation for locals - thought the railway is of course the very reason the suburb exists too. The streets near the depot give away the lofty and distant pretensions of the Metropolitan railway perfectly with Verney, Quainton, Aylesbury and Chesham Streets butting up against the sweep of rails, describing the distant green termini of inter-war Metroland. But for well over a mile, the district is divided - the options are to head south for the complex junction of the North Circular or to head north to Wembley Park. It's a long walk, and a traffic choked drive whichever way you head - and during events at Wembley Stadium, it must be near impossible. The river continues, resolute and undiverted, under the lines in culvert. Aware of the cost of these diversions, both in time and in distance, I turned north into a residential area leading to Chalkhill Park. Parents creaked their way through exercises on the outdoor gym equipment while children played. I paused, listening to the trains rattling by mere feet away while I rested and regrouped. Missing the route to the south, along the riverbank in a deep, unloved urban gulley felt like an omission. Perhaps it would be easier to manage in the winter with less overgrowth? In any case, this wouldn't be my last diversion of the day. One unexpected bonus of having to head north via Wembley Park was a sighting of the Wealdstone Brook. With the stadium's signature arch looming giddily overhead and the wrap of neon advertising screens around its perimeter casting an unreal blue light over a growing district of towers and retail outlets, it was comforting to find this little river occupying a gully in the floor of a deep, wide culvert. The brook is seemingly a somewhat ephemeral stream in drier seasons, but it flowed nonetheless. Wembley felt like a western reimagining Stratford in a way that the Westfield outpost at Shepherd's Bush never quite has. Perhaps it's the availability of open, former industrial land to pepper with student accommodation and luxury flats, or the relatively poor finances of the host borough allowing them to be persuaded to part with extensive permissions to allow rapid, high-rise development? In any case, like Stratford, the job is unfinished here too. 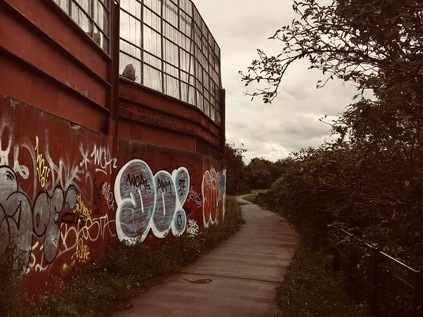 A few steps along the edge of the Wealdstone Brook and I was deep into a unwelcoming and litter-strewn industrial estate which skirted the railway land. The brook meandeed back and forth, and I was intrigued by following its progress - so much so that I strayed past a gate and into a contested street which appeared to be privately owned. Trucks thundered between warehouses and cars were haphazardly abandoned without any thought for access. I was the only human here who didn't glow in hi-vis, and I was conspicuously not hard-hatted or safety-booted. A group of young Polish men watched me from a perch on a convenient concrete block, scanning me as I walked by and murmuring. They were more likely to wonder why I'd want to come here than if I was permitted to be here, I reasoned as I tried to exude confidence and purpose despite a growing limp and a sheen of sweat from walking in a coat on what has turned into a warm day. Finally back on semi-public land, I crossed Atlas Road and passed into Brent River Park. The name promises much, but the reality is a narrow strip of woodland between warehouses and aggregate depots - in its own way though, it is an oasis. Deep below the path, the Wealdstone Brook met the Brent, and the invigorated river turned southwards again. The walk here was surprisingly pleasant given the somewhat down-at-heel feel to the area, and I was largely alone until the underpasses which carry Great Central Way and the railway which it is named for overhead. A cyclist caught up with me, politely dinging his bell as he passed. The path broadened into the edge of Tokyngton Recreation Ground - and again I've been here before, having briefly entered the park to walk parallel to the North Circular. Today I walked the full length of this rather fine green space, noting that the Brent was considerably less noisome and more animated than the still, green waters I found back in the summer. The path was uneven and surprisingly tough going as my feet tired and ached, but I pressed on for the crossing of Harrow Road. A huge crop of Shaggy Ink Caps, a surprisingly large mushroom sometimes known as Judges' Wig, peppered the grass between the river and the path. 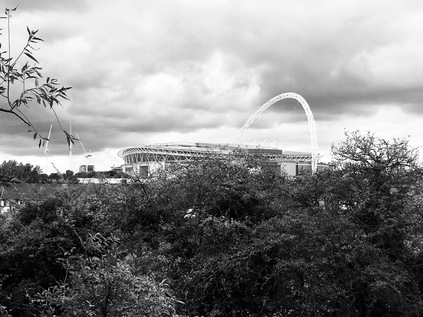 Above the trees the arc of Wembley Stadium fills the middle-distance, a reminder of the diversion I've taken to get here. The river disappeared into culvert alongside the concrete staircases and tower footings of Wembley Point, and once again I was marooned beside the North Circular briefly, and reminded of how the road and the river are intricately related here. I pressed on into the industrial hinterlands of Stonebridge Park, passing under the railway from Euston and near the Ace Café. The sky was greying distinctly and the day feels ominously short now. I wasn't sorry to pass under the odd combination of aqueduct and bridge carrying the Grand Union Canal over the A406 and to turn aside from the road again. The Brent surfaced behind the grimly utilitarian Travelodge and I was able to walk close beside it once again on Queensbury Road which marked the edge of the Abbey Estate and the southern edge of Alperton. An unofficial but well-worn path ran along an embankment beside the river, with a broad strip of grassland separating it from the road. On the other bank, a wall of industrial premises filled the space between the North Circular and the river. My hasty planning indicated that this makeshift footpath joined an official route which passes under the Piccadilly Line beside the river, but it soon became clear that the way was blocked by building works. Faced with another diversion, my spirit was almost broken. The only escape was to cross a tiny footbridge over the Brent, edge my way between industrial units on a permissive path and return again to the North Circular. I found myself approaching the Hanger Lane Gyratory once again, this time from the east. Little changes here - the traffic is still solidly blocked - moving almost imperceptibly around the junction, and the fumes hang as heavily as ever above Hanger Lane station on its isolated island site. This time I turned north onto Ealing Road to regain my route. The river took a more direct journey, and reaching it as it passed under Vicar's Bridge seemed to take a long hike. Here at least though, the Borough has had a short-lived outburst of pride in the waterway which provides its name, with a battered but sizeable sign marking its crossing. Beside the bridge, an ill-maintained but wide and street-lit path with an associated cycleway disappeared around a corner. This felt initially promising, and I headed into the cool green tunnel formed by the overhanging trees, skirting a bunch of off-duty supermarket workers necking Fanta laced with vodka and kicking off their weekends in a somewhat down-to-earth style beside the Brent. The river was hemmed in by buildings and ran swiftly in a channel here, but I was pleased to be beside it again. The direct footpath offered some hope of making a little more progress than I'd expected given the day's frustrations and an unexpectedly shorter route might keep me moving for a little longer. But then, suddenly, the path disappeared. The flagstones ceased, and the cycle path stuttered into a muddy emptiness with just a single streetlamp as an ellipsis. This was at least an indication that there was some intent to go further, but presumably the cash ran out. Instead I'm forced to turn aside into the nearby Industrial Park. The threatening clouds choose this moment to burst above me. The dry, dusty pavements reeked in the rain. There was obvious way forward and I found myself involuntarily back at Vicar's Bridge, drenched and having gone nowhere at all. It's the final straw for my tired feet. I have enough energy left for a push onwards to find transport home, but not more. The Brent - assisted by my foolhardy lack of planning - has beaten me today. You can find a gallery of photographs from the walk here.